In every water drop lies the secret of life. Life can get less than nice at times. I’ve been focused on a very personal photography project, which is due to appear soon in my more personal blog, Ojo de Piedra, so I haven’t had much time to think about what to share here and in my facebook page with you. The deepest feelings of true love and life that I experience come from when I am fortunate enough to be into raw Nature, and the photographic views I can distill from the experience are a reminder of the important things than enlighten and nourish my soul. Plants life from the tropical forests of Quintana Roo, Mexico. Riding my bicycle an Travel are two of the things, besides Photography, that I enjoy the most. For a Flashback Friday, I want to share here this photo. For the mentioned above and for the light and overall scene, when I saw the shadow of a bicycle drawn by the afternoon sunlight last March 2017 near Mahahual in Mexico I really had to press the shutter button on my camera. High with the Nikon F100 and TMax 400. I find myself truly most at home in Nature, away from the urban surroundings close to home. Not so long ago my main outdoor activities implied searching for and exploring caves and, even though I’d love to I haven’t done much mountain climbing, yet. On the last time on the higher side I was fortunate to visit with some friends La Malinche Volcano in Mexico and I of course brought my camera with me, two cameras indeed, my recent image making machine of choice, the Nikon F100, and a Nikon D200 for the more immediate digital experience and as a backup just in case. In the end I made more images with the D200 than with the F100, in several scenarios I used both cameras mostly before sunrise to experiment a bit with low light and see how much I could push the film limits in those conditions and trying to avoid the use of the tripod since the main goal of our visit was to reach the summit in time. Here is a selection of my most liked images made with film that day. I hope you enjoy it. Image made while climbing La Maliche volcano, Tlaxcala, Mexico. Nikon F100, Kodak TMAX 400 film. ©Eduardo Mendoza. November 2017. Climbing La Maliche volcano, Tlaxcala, Mexico. Nikon F100, Kodak TMAX 400 film. ©Eduardo Mendoza. November 2017. Cactus are such a beauty of the botanical world, their multiple shapes, the distribution and forms of their thorns, how they can live on their own or in an ordered, almost architectural group and their ability to survive in very harsh environments always make me stand in awe in front of them. Here I had a few minutes of joy contemplating a group of cactus drawing its dark silhouette against the evening sky. For making the image I used my Fujifilm XT10 camera handheld with the 18-55mm lens. What is your photography style, color or B&W? I truly love the feel of a Black & White image, the emphasis on the light, composition, shapes, volumes and textures yields something special about it, even when it’s about Nature I love to render it in B&W, contrary to the more documentary or scientific approaches where color becomes very important. 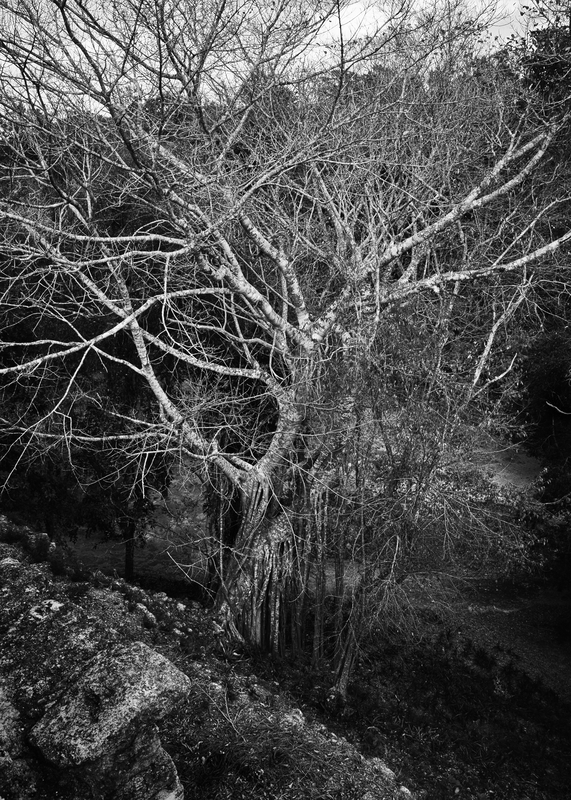 In this example of a large tree rooted in the basement of an ancient Maya building in Quintana Roo, Mexico, the color rendering of my Fujifilm camera did a lot of justice to the scene, so after some tweaking in the computer at some point I just wanted to see how it’d look when turning it into B&W, and it just seemed like magic. Artists are prone to see things through a feelings filter though. Days later I took a look at the color version, and I just also loved it too, since then I’ve gone back and forth between the two versions without being able to make up my mind about which one to share with you, so here are both, please tell me which you like the most. Fujifilm XT10, 18-55mm lens, developed in Luminar. The color palette before Winter ends. Here in Mexico we don’t have those snowy landscapes as far as the eye can see, with the exception of of the highest mountains on the very wet and cold days, however there is a color palette in a lot of regions dominated by the hues of dry vegetation, a subtle reminder of the yearly Life renovating cycle. Cause in the end the image is what matters. Among photographers there are several paradigms that set the way we view and think about our own work. One of the most common paradigms is that in the image making process “the camera is just a tool”, and while that’s true, it’s also true that a good (or great) tool allows for a finer craftsmanship. In fact, I think it would be better to say that the camera-lens duo is not just a tool, it’s THE TOOL. Taking it even further, as artists many of us photographers are beings that live through emotions and feelings. The fact is: the experience of making an image or a series is often as important as the result, sometimes even more. For sure part of the process implies the interaction with the technological side of photography, so, be it for documenting or for developing our own interpretation of life and the world around us, if the gear we use to capture a slice of time is something we like and feel joy to put our hands on, making us want and lust to grab it and make click, much more the better! All of the written above, being myself a person with feelings, perhaps is a way to justify myself, and introduce you to the result of my latest crisis of gear acquisition syndrome. Here’s my new gorgeous toy, and yes it’s not a digital camera, it shoots 35mm film, after all, in the end the image is what matters!! 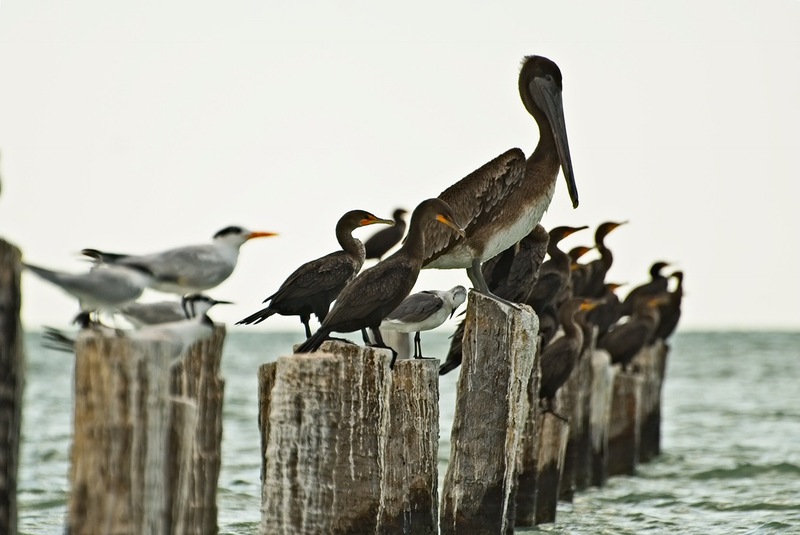 Seabirds in line at the coast of Campeche. While taking a break from the road close to a small group of houses next to the sea, I saw flying wildlife make good use of man made facilities. Seabirds resting between dives into the water to gather some fish. Coast of Campeche, Mexico. Amidst the ancient buildings of the great Maya site, inside the Calakmul biosphere, Mexico, giants watch over the forest and its creatures, embrace the Earth and connect it with the Sky. Roots of Life. Calakmul, Mexico . March 2017. Photo credit: Eduardo Mendoza. A twisted and moss covered tree. R.B. Calakmul, Campeche. Mexico. March 2017. © Eduardo Mendoza. Red huge tree reaching for the sky. R.B. Calakmul, Campeche. Mexico. March 2017. © Eduardo Mendoza. All three images were made with my Fujifilm XT10 and the XF 18-55mm fujinon lens. Heading into the high mountain, which in fact is an old slept volcano is quite an experience! Being at high altitude gives the chance of experiencing an environment that is kind of otherworldly with peculiar landscape vistas and plant species which are examples of life endurance struggling to survive in a low oxygen atmosphere. Most of the images are made at above 3500m ASL with my Nikon D200 and the lens I used all the time, a 50mm F1.8., with a couple of them including the panoramic shot where I really wanted to get a wider field of view I used an iPhone. Nevado de Toluca, Mexico. July 2017. © Eduardo Mendoza. High altitude local flora. Nevado de Toluca, Mexico. July 2017. © Eduardo Mendoza. Small flowering plants. Nevado de Toluca, Mexico. July 2017. © Eduardo Mendoza. Here you can find about my encounters with life and adventure through photography.